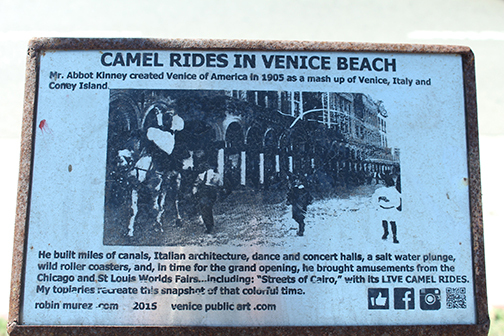 Text from the plaque: Mr. Abbot Kinney created Venice of America in 1905 as a ash up of Venice, Italy and Coney Island. 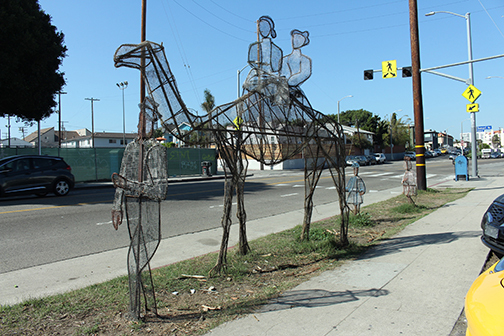 He built miles of canals, Italian architecture, dance and concert halls, a salt water plunge, wild roller coasters, and, in time for the grand opening, he brought amusements from the Chicago and St. Louis Worlds Fairs, including: "Streets of Cairo," with its live camel rides. My topiaries recreate this snapshot of that colorful time.